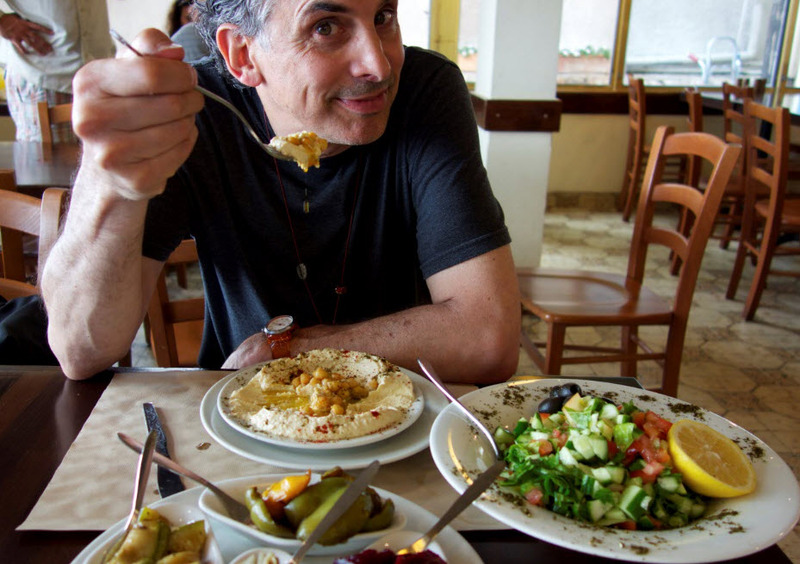 In director Roger Sherman’s latest documentary In Search of Israeli Cuisine (Menemsha Films) we learn there’s a lot more to Israel’s culinary culture than just milk and honey. Our guide is the James Beard Award-winning chef Michael Solomonov who leads us on a journey throughout Israel from an obscure mountaintop restaurant and a city-centric restaurant where Palestinian cooks work the line beside Jewish cooks to seaside cafés, where dozens of varieties of fish are found in vast outdoor markets, to discover the “true” Israeli cuisine through its people. 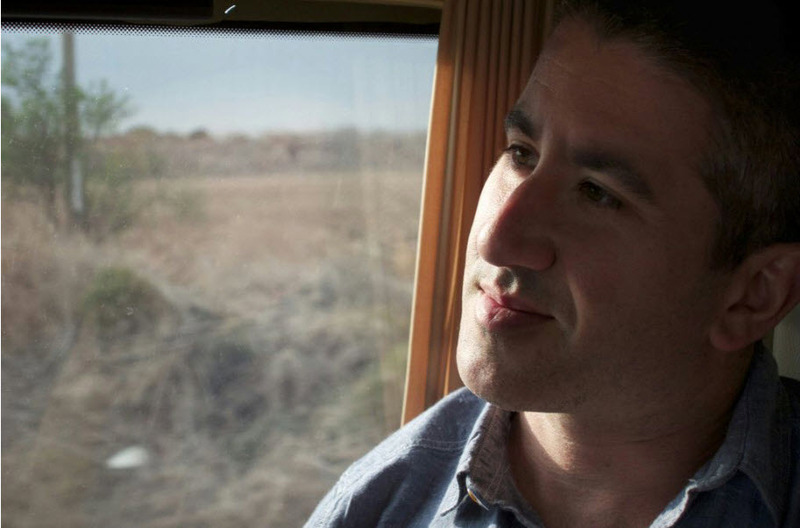 Best known for his two Philadelphia restaurants, Zahav and its sister restaurant, Abe Fisher, where he expresses his passion for modern Jewish cooking, the young Israeli chef shows us it’s about more than hummus or falafel and deeper than kugel or chopped liver. The film gets at the root of a culture and its history through its cooks – both amateur and professional – revealing the complexity of a country whose traditions and customs have deep roots, many which descend from outside its borders. 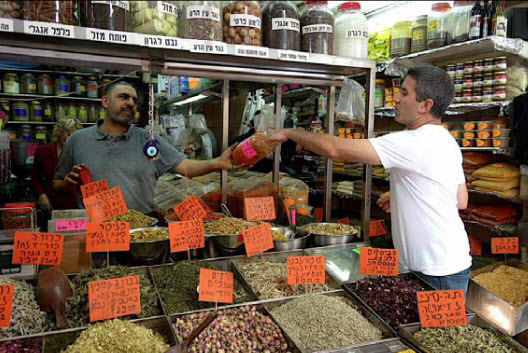 We learn that Israel’s cuisine is informed by dozens of other countries and traditions over centuries of immigration – Jewish, Turkish, Arab, Muslim, Spanish, Mediterranean, Moroccan, Indian, Bulgarian, Christian, Syrian, Lebanese – in a mosaic of 150 different cuisines. 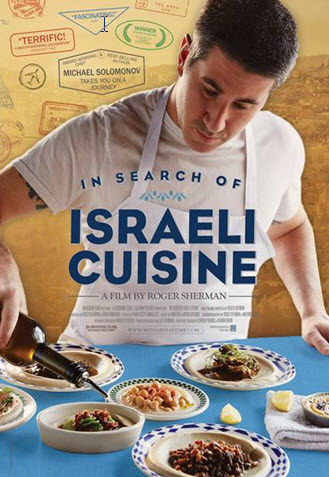 The documentary is a love story of sorts – one of the self-determination of immigrants, the rejection of the old ways by Jewish newcomers and the culinary influence of those who reached its shores with their grandmother’s recipes. It is told primarily by chefs and local journalists – and it’s as much a tribute as it is a learning curve. We learn that “Food is not political,” and “Food makes peace.” May it be so. Solomonov takes us into the hills to Rama’s Kitchen, a French-inspired restaurant that forages for sumac to flavor its dishes and sources all its ingredients locally, before traveling north to listen to chef Uri Geremias of Uri Buri in his restaurant by the sea. And there’s a tender segment in the simple home kitchen of a woman preparing the sacred Sabbath meal for her extended family. Noted Jewish-American chef and cookbook author, Joan Nathan, weighs in with her extensive knowledge about the changes in Jewish society where 80% of its citizens are non-religious. Solomonov visiting country farm ingredients source. 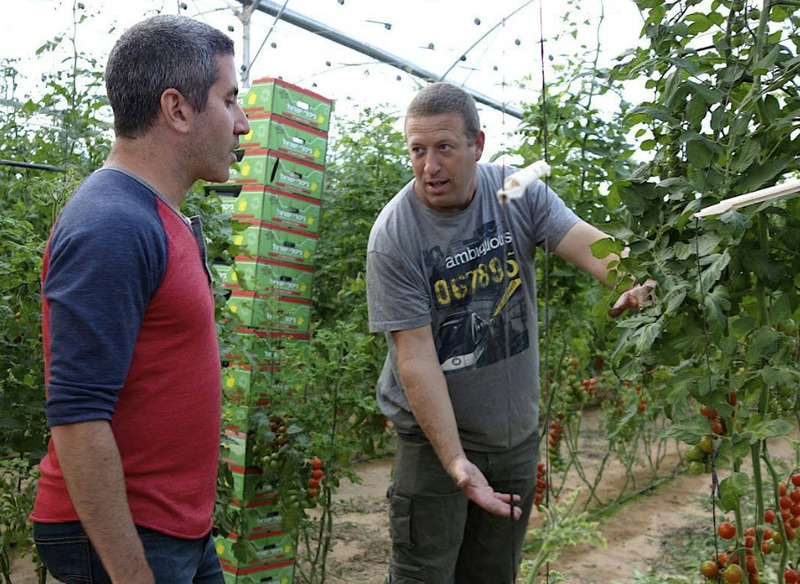 To understand the inspiration for many of these chefs as well as Israel’s home cooks, Ezra Kedem of Arcadia Restaurant in Jerusalem clarifies, “I cook my memories.” From Moshe Dayan’s hybridization of the cherry tomato to the sophisticated irrigation system of stepped dams that water fruit trees, vineyards and olive groves, their gifts to our kitchens are endless. Not all of us will be guzzling Guinness or Harp while wearing shamrock beads and green Pilgrim hats on St. Patrick’s Day. I leave that to those cookie-baking elves. As fanciers of Irish beer, Kerrygold butter and Irish cheddar (how did we ever live without these? ), there are other ways to celebrate the Auld Sod. 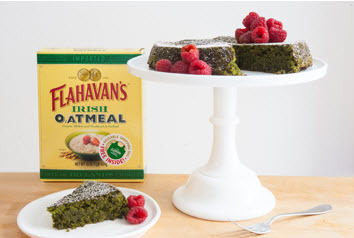 Recently Flahavan’s Oatmeal hit the US market. 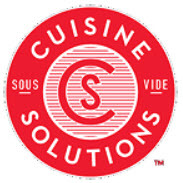 Their non-GMO and gluten-free products are now readily available in our area and around the country. The company, based in Ireland, boasts a seven-generation provenance. Surprisingly, this is the pre-eminent oatmeal in Ireland, and rated Ireland’s favorite food brand. I loved hearing that it is also Ireland’s oldest family-owned company. Another little-known fact is that Quaker Oats and John McCann’s – the so-called “Irish oatmeal” we see in our supermarkets – are completely unknown there. Oddly enough McCann’s is processed and packaged in the US. So if you want real Irish oatmeal, I urge you seek this product out. Yesterday I spoke with CEO John Flavahan by phone who rang me from Waterford County, Ireland where the company is based. Due to the blizzard, his flight to the US was cancelled and unfortunately we would not have the opportunity to meet in person. Still I was ready to learn more about his company and hoped to seek clarification of the sometimes-confusing types of oatmeal. John’s Irish lilt was a joy to hear as he lovingly spoke of his ancestors and the history of their centuries-old mill. He is especially proud of the mill’s award-winning approach to sustainable production and renewable sources. Our conversation below is followed by fantastic several recipes to try at home. Whisk and Quill – As the oldest mill in Ireland, your mill is a veritable anthology of the history of milling in Ireland. How excited are you to introduce your oatmeal to America? Flahavan’s is the oldest grain mill that is still working in Ireland. Given my family’s long history in milling, I have a great personal interest in history and have enjoyed tracing back the history of the company to 1785. This is when my great, great, great grandfather took over the mill, and it is quite likely that the mill was operating before that. There are records in the 1656 Civil Survey showing that there were two mills in the village of Kilmacthomas, and we believe that the Flahavan’s mill could be one of those mills. In my quest to know more, I discovered old letters from America dating back to the 1850s and 1860s from a family member (Matthew Kelly) in Chicopee Falls, MA, USA to my great grandfather, Thomas Flahavan. One of these references the political climate among the States following the election of a new US president: Abraham Lincoln, when he described with the ultimate understatement that “The South don’t like him” Matthew went on to describe the taking of Fort Sumter which was the first act of the Civil War and mentioned the rebels attacking towards Washington. So you can see how our family has been engaged with the USA throughout our history. We often hear stories of Irish people travelling back to the States with Flahavan’s packed into their suitcases or asking family at home to send care packages over to them in the US. Equally many American visitors to Ireland have discovered our creamy oats while visiting Ireland and contact us to find out if they can purchase our products in the States. Today, I see great synergy between our values of wholesome, delicious wholegrain goodness and the growing foodie / health trends that America is currently valuing, perhaps more today than ever. Can you describe the difference between instant, steel-cut or pinhead oats, rolled oats, quick oats, and old fashioned? Steel Cut Oats are produced at one production stage back from the rolled oats. They are produced using the whole roasted groat, cut with a steel blade just two or three times to preserve a nuttier, richer texture. Steel cut would have the lowest GI. Quick-to-Cook Steel Cut Oats are the same as Steel Cut Oats, but cut into smaller pieces to enable quicker cooking. Rolled Oats are the Steel Cut Oats, steamed and rolled into the flat flakes with which you might be most familiar. 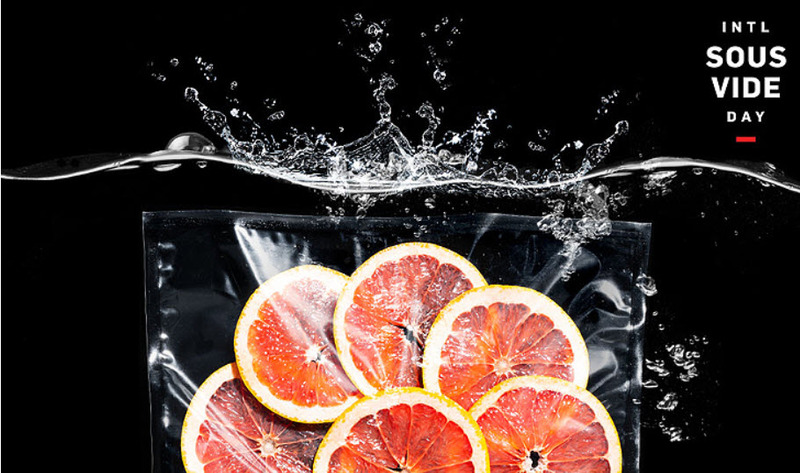 This process also enables a quicker cooking time of just 3 minutes. Pinhead oats are effectively the same as steel cut oats. They are known as Pinhead oats in Ireland and as Steel Cut Oats in the US. We do not sell “instant oats” in the US. Our rolled and quick to cook options are so wholesome, unsweetened, quick and simple to make that we believe they suit the busy but health-conscious lifestyles of American consumers well. What’s the difference between Scottish oats and Irish oats? One key difference – between not just Irish and Scottish oats, but oats from Ireland’s South East and elsewhere – is the unique microclimate of the South East of Ireland. We use specially selected oat varieties that are perfectly suited to the exceptionally long, damp, mild growing seasons which allow for more complex flavor development. What do you do with the bran part of the oat? Our oatmeal is sold as a whole grain without the bran removed. However, we can actually separate out the bran to produce a product called oatbran, which we sell in small quantities in Ireland. It is most commonly used in baking wholesome Irish brown bread but can also be used as a porridge. “Oatlets” is not a term that is relevant to the US market. In the Irish market we brand the equivalent of the Rolled Oatmeal US product as “Progress Oatlets”. 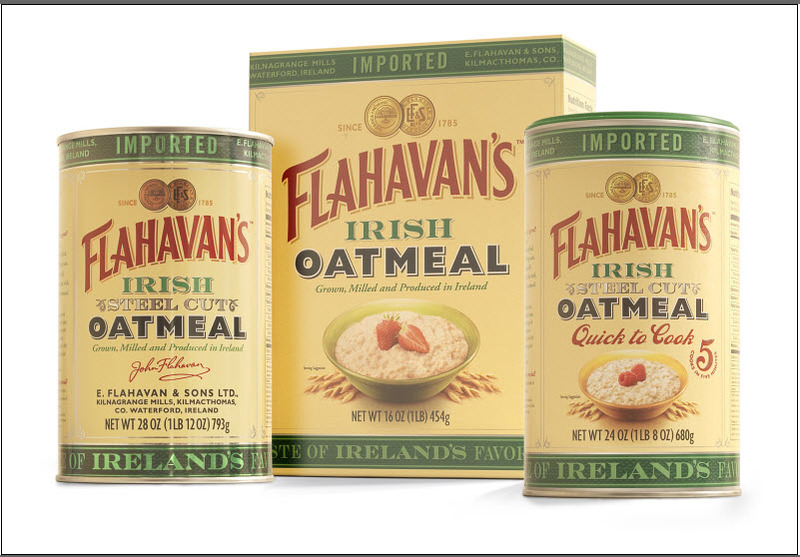 This is an historical term that dates back to 1935 when Flahavan’s were the first mill in Ireland to begin rolling the steel cut/pinhead oatmeal into flakes in order to reduce cooking times and make the product more relevant to modern living trends. This was seen as very progressive at the time, hence the phrase “Progress Oatlets” was coined. We have registered it as a trademark. In the US, these rolled oats are simply called Flahavan’s Irish Oatmeal. Most Americans are familiar with Quaker Oats and John McCann’s. Tell us why Flahavan’s is a better choice. Well, Flahavan’s is still a 100% family owned company with an historic milling tradition and 235 years of experience. We’ve been sourcing our oats from local family farms within 50 miles of the mill for generations. Everyone knows Ireland as having a mild damp climate, particularly in the South East and our local oat growers use specially selected oat varieties that are perfectly suited to these ideal oat-growing conditions. The oat grain therefore develops and ripens more slowly which produces a plumper grain filled with more natural starches thus enabling us to produce a distinctive naturally creamy Flahavan’s oatmeal, with a delicious wholegrain texture. Smaller scale, sustainable production is also at the heart of Flahavan’s 230-year old milling process. Over 60% of our mill energy comes from our own renewable sources. The millstream was originally channeled along the valley of the River Mahon and was used to power the mill wheel is still used to this day, but we are now using a water turbine installed in 1935 to generate a proportion of our electricity. We also burn the outer shell (the husk) of the oat to generate the steam used in our cooking process and use our own large scale wind turbine to generate electricity to help power the mill. Flahavan’s produce, package and ship Irish oats worldwide from here. It’s also worth noting that Irish oatmeal consumers would not be very familiar with Quaker or John McCann’s. Flahavan’s is the most popular brand of oatmeal in Ireland, where people eat more oatmeal (60 portions) per capita than in any other country. Do you process your oats on grinding stones or with steel blades? Even though we’re a small company we are still relatively modern and use steel blades to produce our oat flakes. What will I discover about the taste of your Irish oatmeal vis a vis American oatmeal? You’ll find Flahavan’s oats have a more wholesome texture and a naturally creamier taste than oats grown elsewhere, thanks to the unique Irish microclimate and our distinctively small-batch, slow-roasted, sustainable production methods. I would sometimes soak the oats overnight for an extra creamy bowl of porridge but I would always use some raisins pre-soaked in apple juice as a topping. Which of your products is the most popular in Ireland? Our most popular product continues to be our Flahavan’s Progress Oatlets, which is the very same product that can be found in our Irish Rolled Oatmeal box in the US. What is baobab powder? I see it listed as an ingredient in one of your recipes online. Baobab powder is a superfood gaining in popularity in health food circles for its high levels of vitamin C, other vitamins and minerals and a supposed immunity-boosting value. It comes from the raw fruit of the baobab tree, which grows in Africa and some parts of Australia. In our recipes, we like to maintain a balance between the enjoyment of traditional oatmeal preparations and innovations that authentically reflect the globalizing popularity of our oats. For example, Flahavan’s oats have become popular in South Korea as a healthy source of whole grains and so we have enjoyed developing recipes that honor South Korean flavors, such as Turmeric Kimchi Oatmeal with a Fried Egg. Do you use oat groats to process your oatmeal? There is essentially a groat in each individual grain of oat. We slowly kiln these groats twice, while still in their husks, to optimize their flavor and naturally creamy texture. We then remove the husks and cut the groats using a steel blade. To make rolled oats, we then steam and roll the cut pieces into flakes. We power the steamer using our own renewable energy, which has been generated by burning the discarded husks. What products are available here in the States? What else would you like our readers to know. We are committed to innovation and sustainability. Flahavan’s is one of the founding members of the Irish Food Board’s Origin Green Programme, the only sustainability program in the world that operates on a national scale, uniting government, the private sector and food producers through Bord Bia, the Irish Food Board. This independently verified program enables Ireland’s farmers and producers to set and achieve measurable sustainability targets – reducing environmental impact, serving local communities more effectively and protecting the extraordinarily rich natural resources that our country enjoys. We are proud to say Flahavan’s has been recognized on numerous occasions by Irish green industry leaders for our sustainable approach to milling, which in February saw Flahavan’s winning 3 awards at the Green Energy Awards 2017 (Green Food & Beverage Award, Sustainable Green Energy Award and Green Medium-Sized Organisation of the Year). For us, it’s all about wind, fire and water. Investing in a wind turbine in December of 2015 reinforced our commitment to a sustainable future. We also use a special technique of burning the discarded oat husks that fuel the boiler used in the steamrolling process to make rolled oats. This eliminates the use of diesel fuel. Also, the mill captures the power of the local River Mahon, just as it has done for over 230 years. We are a seventh-generation family company. I am the sixth generation, and my son James and my two daughters, Annie and Ellen, also work in the company. Place the oats and milk in a saucepan and bring to a boil. Reduce heat and simmer for 5-7 minutes until cooked. Place in a bowl and drizzle with honey and cream. Top with Irish Mist Liqueur. Mix the Flahavan’s Organic Irish Porridge Oats, almond milk, cocoa powder, cinnamon and agave syrup/honey in a re-sealable bowl and leave in the fridge overnight. 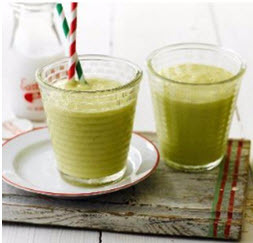 In the morning, add the banana to the oat mixture, then place in a blender and blend until completely smooth. If the shake is too thick, add more milk for a thinner consistency. If it’s not sweet enough, add more of your preferred sweetener. Top with popcorn for some extra-special froth. Combine the warm waters and matcha green tea. Whisk vigorously to froth the tea. Separately, in a large mixing bowl mix all dry ingredients together. Mix coconut oil, orange blossom extract, and orange juice together in a separate bowl. Mix wet ingredients into dry ingredients and stir to combine. Beat the cake mixture by hand for 3 minutes. Let batter sit at room temperature for 30 minutes. Grease the inside of a 9-inch cake pan with coconut oil. Add batter to pan and spread evenly. Bake the cake for 30 minutes until a cake tester comes out clean. Turn cake out onto a cooling rack and cool completely for at least an hour. Dust cake with powdered sugar and fresh berries. Jerome Grant is exactly where he’s supposed to be. And for that he exudes gratefulness. 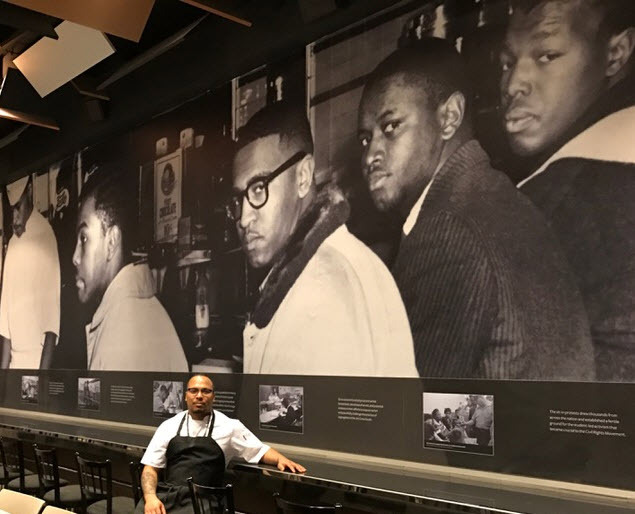 As the first Executive Chef of the National Museum of African American History and Culture (NMAAHC), the young chef had long dreamed of working at the newest museum on the Mall. In the works for the past hundred years, the museum at finally opened to the public last September. It seems unfathomable that we ever lived without it. 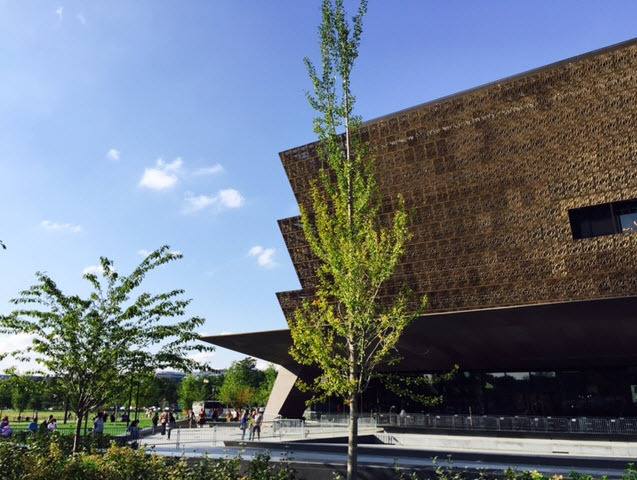 The building’s unique architecture rises both in tribute and testimonial to African Americans and their indelible contributions upon the fabric of this nation. For Grant, its opening was timely, completing his own truly American story of his rise to success at the helm of a new icon to African American culinary roots. 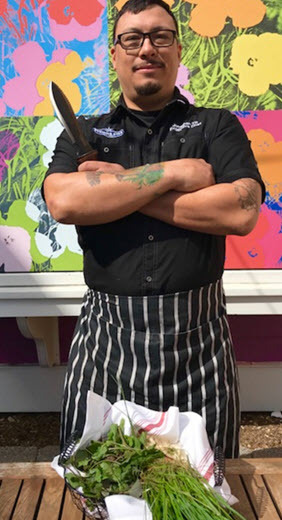 Seven years ago Grant began his Washington area career with Restaurant Associates serving as Sous Chef to Richard Hetzler at the Mitsitam Native Foods Café, the award-winning restaurant ensconced in the National Museum of the American Indian (NMAI). Grant was there when Hetzler’s much lauded cookbook, The Mitsitam Café Cookbook, was published. Here he found a mentor in Hetzler who prepared him for the job of running large scale food operations. 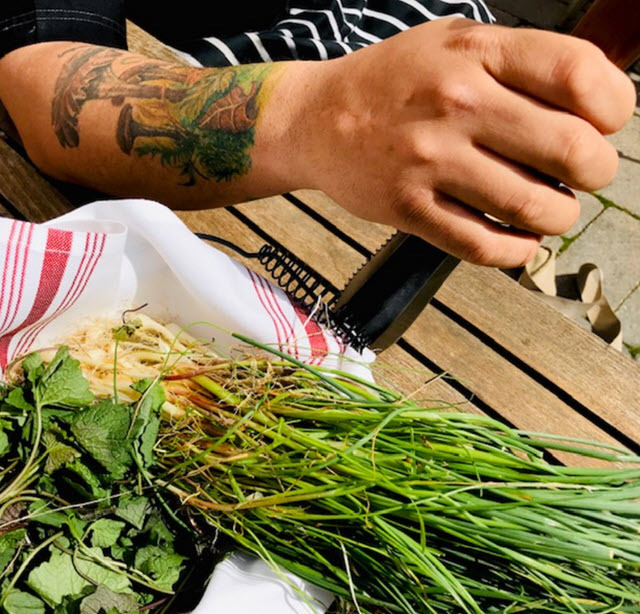 When Hetzler moved on, Grant took the helm, developing his own approach to seasonal and regional Native American dishes. In 2013 Restaurant Associates gave Grant a promotion to work at the Castle Café. He wasn’t particularly looking forward to preparing soups and sandwiches, “I went through the motions”, but he accepted with the guarantee of moving over to Sweet Home Café in 2016. 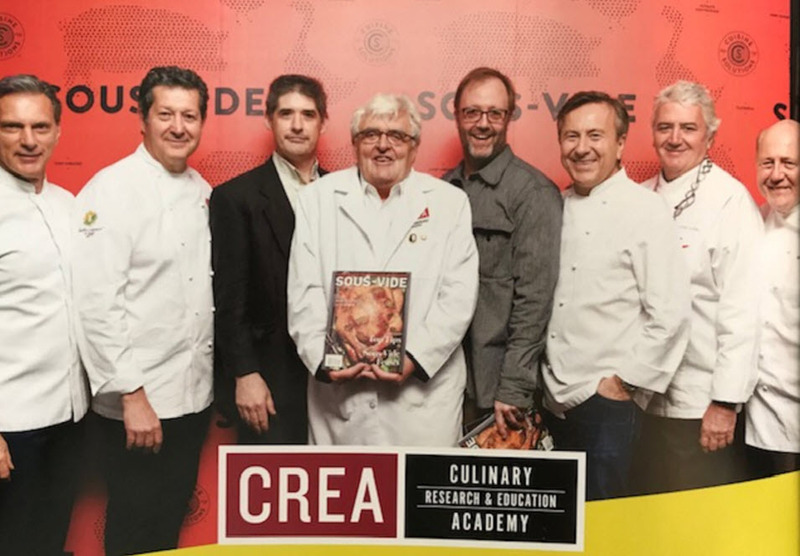 Last year under the guidance of RA Culinary Supervisor Albert Lukas and Bravo Top Chef finalist, Co-Host of ABC’s The Chew and NMAAHC Culinary Ambassador Carla Hall, Grant began taking the reins in the pristine 10,000-square foot kitchen. But before all that the chef watched the museum rise slowly out of the dirt and reflected on his own story. A parallel tale of ancestors making their way to America. In his case two grandfathers who emigrated from the island of Jamaica and came by boat to Philadelphia. 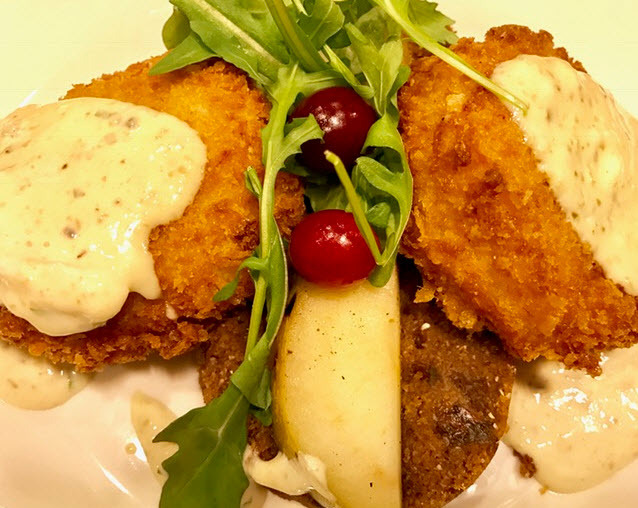 In the beginning Grant worked alongside Lucas to identify the separate regions represented in the café – the Agricultural South, the Creole Coast, the Northern States and the Western Range – each featuring their own historically-influenced dishes. To her credit Hall was positive and supportive, offering suggestions and critiques while texting encouragement as the menu began to take shape. From the start Grant and Lucas set a goal of “low and slow”, taking small batch cooking and expanding it to accommodate larger crowds. The 400-seat cafeteria style restaurant goes through 1,000 lbs. of oxtail every week for its Jamaican Pepper Pot Stew and 200 lbs. of catfish every two days. An Oklahoma made smoker handles 900 pounds of brisket, pork, chicken and cold smoked haddock. When it comes to crackling good fried chicken, it’s made three times daily. And Miss Deon, who heads up cold prep, provides the café’s potato salad recipe. 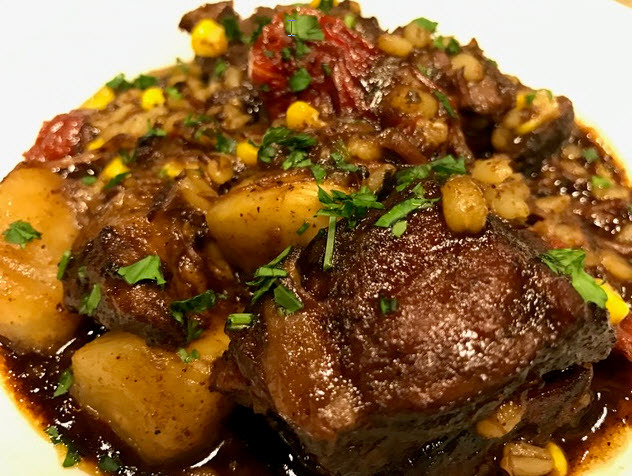 You’ll find dishes that evoke the South like Brunswick Stew with chicken and rabbit, Lexington Style BBQ pork, and familiar delicacies like pickled watermelon rind and sweet corn pudding. 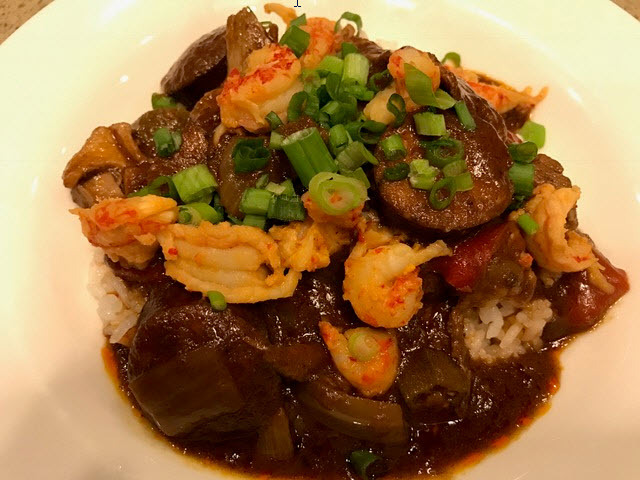 The Creole menu is even more expansive with Duck, Andouille & Crawfish Gumbo, Pan-fried Catfish Po’boys, Shrimp & Grits, Candied Yams and Red beans & Rice. 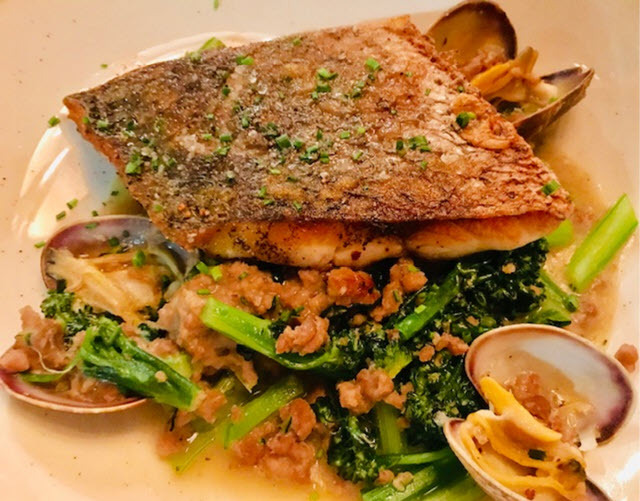 The Northern States menu features Oyster Pan Roast, a dish inspired by Thomas Downing, a New Yorker whose tavern doubled as a stop along the Underground Railway. From the Western Range are two dishes I’ve become enamored of. 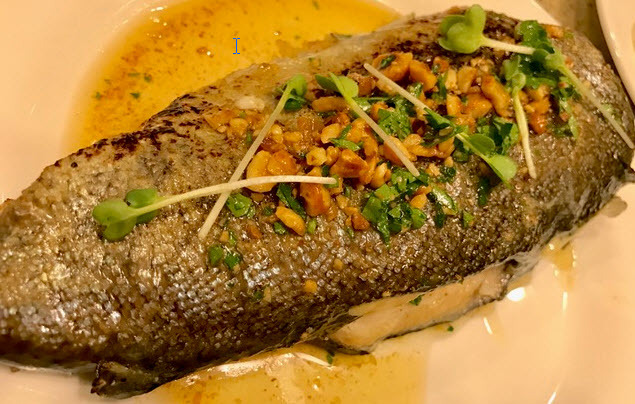 “Son of a Gun” Stew made of braised short ribs and root vegetables and Pan Roasted Rainbow Trout with Hazelnut Brown Butter that I’d swear comes from a cast-iron skillet cooked over a campfire. Go West, pioneer, if you want the High Mesa Peach and Blackberry Cobbler. 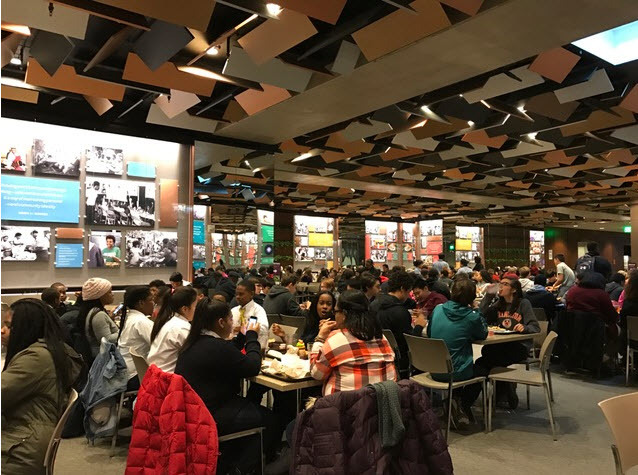 There are exciting new changes on the horizon for the café – an expanded retail operation was successful last Thanksgiving with guests able to purchase whole dinners for takeout. 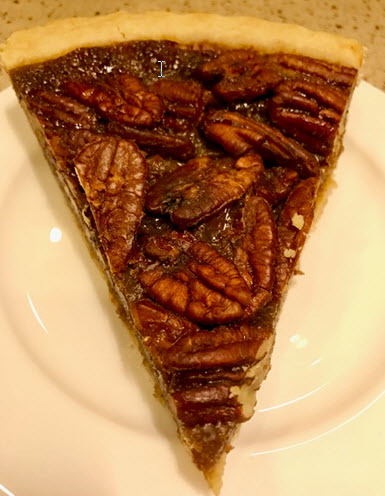 As of this writing you can take home several in-house baked goods including Sweet Potato Pie, Banana Nut Cakes, Corn Loaf Cakes and cornbread. I’m particularly partial to the mouthwatering Chocolate Pecan Pie. Though it’s a challenge to secure a timed ticket, I have been fortunate enough to have eaten at the café three times, trying nearly every main dish and a few of the desserts too. The dishes are inspiring and rich with the history of African influences on the American culinary culture. 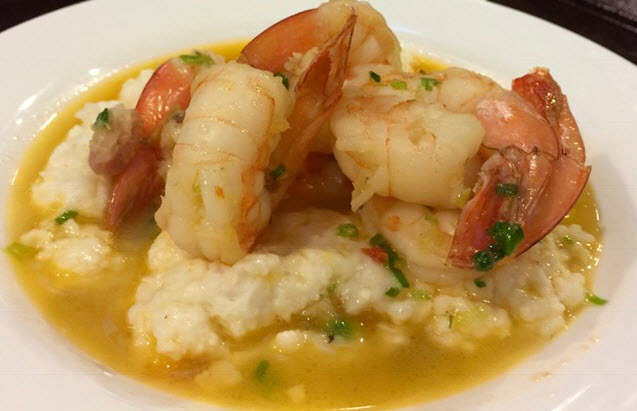 And though I’m certain you will find your personal favorites, mine is the best version of Shrimp and Grits (made with Anson Mills grits), I have ever wrapped my mouth around. Soon everyone will be able to avail themselves of all these delicious dishes without timed entry tickets.